What does Big Data mean for Email Marketing? If you aren’t talking about the opportunities for content marketing in 2015, you are probably talking about the opportunities for ‘Big Data’. 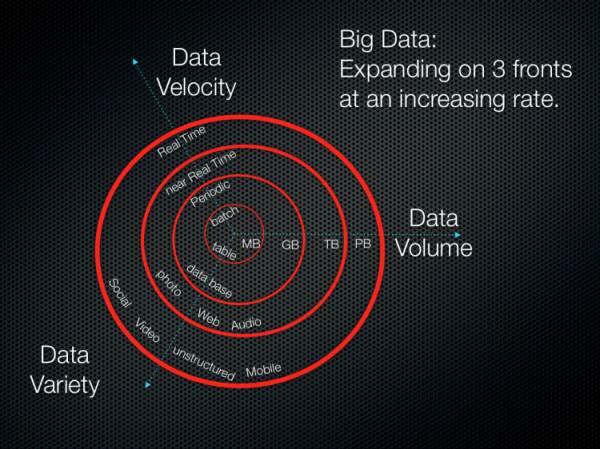 Next to content marketing, big data is a hot trend in marketing right now. Everyone is talking about how they can take advantage of all the data they have on hand; how to slice it, dice it and serve it up with a actionable meaning. Currently, only 25% of businesses are putting their own data into action. This indicates a significant amount of missed opportunities, the likes of which can be extremely valuable once companies discover how to use data in order to drive more engagement, greater reach and growing their business. Emarketer.com reported that when KPMG asked CFOs and CIOs about the impact of big data on business strategy, more than half stated that it was changing everything. That’s a pretty powerful statement! So what is 'big data'? Big data (definition) is the collection of large and complex data sets that are difficult to process, analyze curate and share. Big data should support strategists in solving real business problems and identifying new marketing strategies. Today’s data is available in a wide variety of formats including structured numerical data in traditional databases created from business applications. Unstructured data is developed in text documents, email, video, audio, stock ticker data and financial transactions. Managing, merging and governing the multiple varieties of data are processes many organizations struggle with. Awareness of big data potential is still growing within the marketing world. According to eMarketer, there are still a large percentage of retail executives who are not aware of or not utilizing big data. That’s fairly disappointing when considering a recent Oracle survey of North American retail executives, which showed that nine out of 10 executives believed that a failure to capitalize on the benefits offered by data translated to lost revenues. I’m fairly certain none of us wants to lose revenue. Smart minority in email marketing? Forrester Research determined that marketers are sending out a record number of emails – 258 billion this year alone, a 63% increase from the year before. At the same time, the study concluded that B2B marketers repeatedly scored themselves lowly in terms of using analytical data. What's happening with big data in email marketing? In a CEB survey of over 800 Fortune 1000 marketers, more than half were found to still be relying on past experience and “gut decision making” for creating and optimizing their campaigns. Only 11% claimed that they were using data to support their decision-making, which implies a smart minority. What all these marketers are struggling with is how to leverage customer data in order to optimize and personalize content in email newsletters and other communications. While growing email lists, many email marketers overlook opportunities for improving the targeting, relevance and performance of their email marketing campaigns through big data. Data can improve virtually all marketing efforts, including email marketing. Email marketing will most certainly be a significant part of the big data surge. Experian Data Quality conducted a survey in December 2013 and found contact data to be the most important for marketing success, followed by sales and demographic data. Contact data is the type of data collected in email marketing. 1. If you want to leverage the power of big data, start by figuring out the best way for culling data within your organization. Culling data may prove to be difficult if the data in your organization is managed is silos and not integrated. Many legacy data warehouses have not been architected for easily extracting cross-channel data or for enabling the analysis of data in support of email marketing campaign decisions. Fortunately, once you load the data into your email marketing service provider, managing it becomes much easier. At Mailigen, our Customer Success Managers help clients segment and optimize their email campaigns using our software. 2. The next step is to design a plan that delivers amazing content to the right audience segments through the right delivery channel and at the right time. As if this is not challenging enough, email marketers must achieve all of the above steps while focusing on driving conversions, increasing sales and gaining customer loyalty. A good place to start is by using the data to align with a customer segment. Most marketing efforts benefit from spending time to conduct segmentation exercises. Now that big data has come into play, marketers can use sophisticated email marketing service providers and marketing automation to look more closely at a specific channel and customer segment. For more than a decade, email marketing has been managed using a batch and blast process; however, with 258 billion emails per year and growing, marketers are going to need big data elements for engaging with more precision when building targeted, relevant content and messaging. Additionally, big data provides email marketers with better predictability regarding buying and conversion decisions. Because of this, we will continue to see a rise in triggered and transactional email marketing, using data to drive more open and click through rates and ultimately increasing conversions. As big data transitions email marketing through predictive analytics, open and read rates may becoming less relevant metrics. More important will be to specify what content was most engaging, what was ignored and what was most valuable to the consumer. Unleashing this type of content marketing creativity means you must start with database segmentation. First, define what the problem is you want to solve and how it impacts your business. Then identify the success criteria to understand how and when the problem can be solved. The next big thing is preparing all the components. Decide where the solution will be based: in the cloud or on premises. Understand what data are needed to solve the problem, then asses if you already have the necessary data or if you need to collect it. Identify if your team is knowledgeable enough to solve the problem or if you need additional resources. Pick out the smaller groups of datasets you want to test. Choose the data you already have to make the process easier. Run some scenarios based on demographics, purchasing history, engagement with your brand or competitive data. Set some campaign goals and how you plan to measure them. Solve the problem using success criteria that are easy to measure. Run the campaign and then look at the outcomes. Specifically, look for patterns. If the project runs successfully, repeat it on a larger scale. Segmentation based on patterns can be paramount for delivering more relevant and engaging experiences to your subscribers. Dive deep into the data and use it to understand your customers better, and for improving the overall campaign for mass consumption. If you are able to, marry other data elements with your email analytics to find which segments are consuming what content. If you can reach this level of understanding about your subscribers, you can create and deliver more relevant email campaigns. Savvy marketers are always looking for ways to increase their impact and become more precise in their messaging. Email marketers have a tremendous opportunity for leveraging big data in order to deliver high-impact, relevant content to the right audience segments through the right delivery channel at the right time. If you consider that the majority of email subscribers sign up to receive something – coupons, deals, notifications, business information and more – email is an important tool for gathering and analyzing customer data sets. Invest in making email a vehicle for helping your organization gather better quality data in order to create a more engaging connection with customers. And always remember, the value of email marketing is what you do with the data. Create email campaigns that are highly relevant to your subscribers and generate real brand engagement. Thanks to Liga Bizune for sharing their advice and opinions in this post. Liga is a Marketing blogger and Public Relations Manager at Mailigen, an integrated marketing platform offering email, social and mobile marketing, behavioral segmentation, dynamic content, active RSS, online surveys and more to help businesses build lasting relationships with their audience. You can follow them on Twitter or LinkedIn.